My mom and dad seemed very pleased with the whole evening. Rob has been a DJ with us since 2004. Originally from Ocean City Maryland, he has made his home in Morehead City since 1984. His biggest and most well know strength is his natural sense of humor. Everyone has to smile and laugh from the first time they meet Rob .He is a Jimmy Buffet with a shaved head. Completely able to do any type of event from north to south, but especially great when you are looking for a fun time. 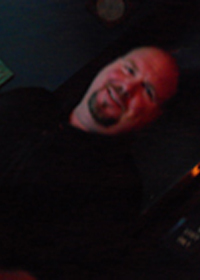 Rob has DJ’d all types of events like, weddings, birthday parties, nightclubs, school dances, and even bike night. He has 2 children and stays very active in their sports and is usually a coach at something or donating for a good cause. Unique music knowledge: Rock and Funk from the 80′s but knows all the regular movers.